Is this a Chinese Imari copy? Chinese Imari Bowl. Floral and Bird Motif. 7 3/4 inches diameter, 3 1/2 in height.
" 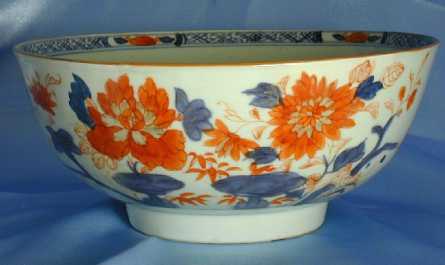 ... Chinese Imari Bowl circa 1760 ..." A friend of mine says this looks like a later copy. Is this possible? Today it is possibly to copy anything so well it is not even possibly to tell from a picture if a piece is ok or not, but this I believe we could trust anyway. Normally you actually would have to handle a piece to be certain. This bowl is soomewhat smaller than an ordinary punch bowl and are called a "slop bowl". It is generally believed that before teapots became a standard item tea was made by pouring hot water directly in the cups with the dish as a small lid while brewing. When you were finished drinking you poured the leafs into one of these bowls. They were anyway a standard part of the early tea sets. The date is wrong though, and should be around 1730-40. Some would date it earlier again but the style is still typical for the first half of the 18th century. Thereafter Imari steadily went out of fashion and was replaced with the rococo-style of Famille Rose.